A folding electric tricycle adds storage convenience to a pedal optional ride for seniors. Almost anyone with the urge to ride can now find a suitable option. One of the issues with a standard electric trike is that they are rather large for storing and transport. Many seniors have downsized their housing which sometimes means less storage space. A trike that folds, and is electric, addresses this issue and opens the door to riding fun to even more people. Most SUV's can accommodate a folding electric tricycle when folded which can add significantly to the fun and convenience. This makes transporting your trike to many more fun places to ride even in other states or remote areas. And, do this without the added expense of a tricycle trailer. Since it has an electric motor you don't need flat as a pancake terrain. Hills with a few degrees rise are not a big deal. Tricycles all use a step-through design making boarding much easier than a traditional bike. They also address the balance issue. The rider can go as slow as they like, without losing balance, and put both feet on the ground while seated. 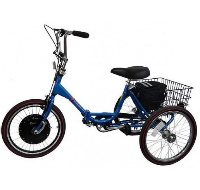 And now, with electric power, you can pedal for some exercise, or sit back and let the trike do the work. How’s that for versatility? Many retirement communities have limited car parking at strategic centers and will only allow golf cars. The down-side of golf cars is you can’t take them on the street. There are few, if any, restrictions on electric bikes or trikes in most municipalities.